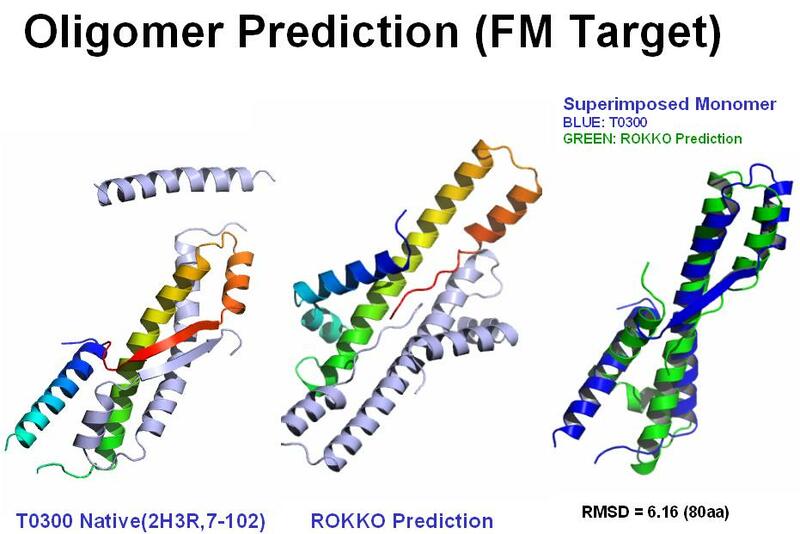 The goal of CASP experiment is to assess the state of the art in protein structure prediction via objective blind testing. During over decade, by providing room for community members who are studying what proteins really are, CASP is one of prominent "academic competitions". Here, I briefly explain the main idea for predicting. 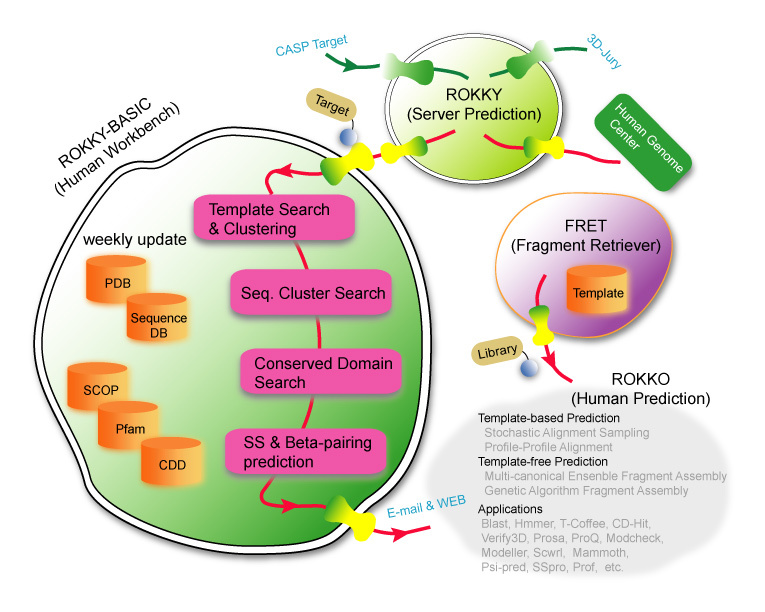 The idea was tested at CASP7 that I participated the competition as a member of team ROKKO and ROKKY (Kobe Univ.). Thus, some of descriptions in here involves the research I did at Kobe univ. And also, it includes results that have done by other team members. We performed the template-based procedure for predicting targets that have significant PSI-BLAST E-value (< 0.001) or 3D-jury jscore (>50.0). For all remaining targets, we conducted fragment assembly(FA) folding simulation with the different types of fragment libraries. When there exist long alignment gaps (>20 residues) or probably unseen domains (e.g. T0311, T0347, etc. ), we first predicted a full-length model with a template and ran FA to predict these broken regions. For a target that is likely to have multiple domains, we parsed it into monomers based on domain DBs, and combined them into a single chain by FA. 13 targets were predicted by the consensus of two FA method (Multi-canonical Ensemble and Genetic Algorithm); by using cluster analysis and visual inspection, we selected five models from independently sampled models by each FA method. Interestingly, we often found that some of models FA predicted have high structural similarity to known proteins. In such cases, we added a template-based model to the final models if we were confident. For example, in T0363 case, we first selected five models from MCFA samples. MAMMOTH said that all five models are considerably similar to a Beta Grasp Fold. 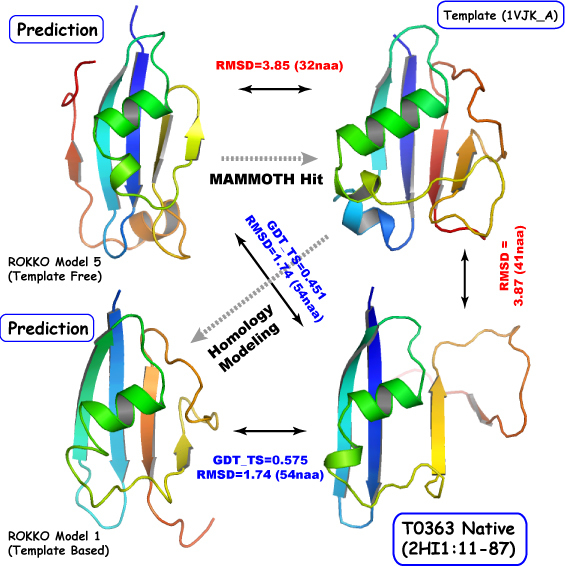 Particularly, model_5 was highly similar to 1MG4_A (z_score=4.92) that is akin to 3D-Jury templates. We believed, consequently, that 1VJK_A (jscore=46.88) is the best template for T0363. Such conspicuous structural similarity with remote homology was found from FA models of several targets (e.g. T0304, T0349, T0353, T0361, T0382, etc.). Surprisingly, a model of SimFold FA for T0383 culled 1QYN_A (jscore=6.25) that is 3.66 Angstroms over 70 residues of the T0383 native. We also predicted oligomer targets using monomers predicted by above method. This is also one of extremely challengeable tasks because such oligomer will change the monomer conformation. We sampled huge number of monomers and docked them exhaustively. Figure on the right side illustrates an example of dimer predictions.